South Park was really funny last night. Reflection (funny that a cartoon warrants reflection) this evening. Theme: You must be responsible for yourself in order to affect change in your life... or maybe it's that the people you put all your trust in might really be pulling the wool over your eyes in order to steal the Hope Diamond from the Smithsonian. Either way. 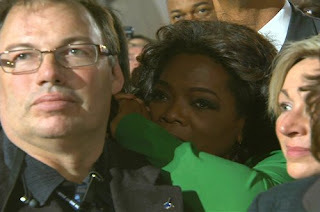 Who the heck was Oprah leaning on Tuesday night? She doesn't know! She gave "Mr. Man" a shout-out in thanks for letting her wipe her makeup on his shoulder though. Weren't we all looking for a Mr. Man to celebrate with? 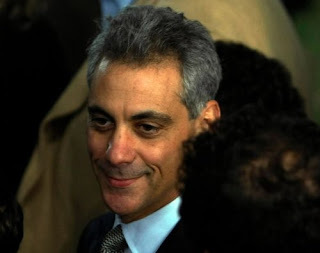 All the chatter is that Rep Emanuel has been offered the job, possibly even before Obama was officially elected. Most think he'll take the job. Tonight, I'll look more closely at Emanuel (of whom I'm a fan), and discuss my disappointment over the poorly-covered tragedies of Tuesday night - the failure of Prop 8 in California and similar losses of rights in Florida and other states.